Canon seems to be a bit less tight-lipped when it comes to their Cinema EOS products. Rumor has it they will introduce new lenses and body for the upcoming NAB Show in Las Vegas on April 6, 2013. The new camera will fill a niche between the EOS-C100 and EOS-C300 models and has both the EF and PL mounts to maximize lens usage. The two current C bodies have a list price ranging from $6,499 to $15,999 so there is room to fit another model in there. 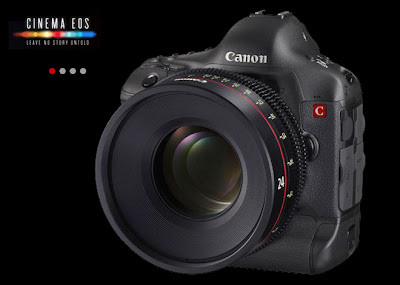 We are also expecting a new Firmware update to the EOS-1D C camera. Read my earlier post on this topic here. Canon is putting in a huge effort to beef up their Cinema EOS product line and is less reticent to 'leak' future announcements. In fact, last year they opened up a Professional Technology Center near the Sunset Gower Studio lots in Hollywood, California to specifically serve the video and movie production companies. I wish they are as studious in their support of the digital photography side of the business. We are still waiting on 'leaks' as to when the EF 200-400mm f/4L Super Telephoto lens and the EOS-7D Mk II camera will come out.